These help measure distance on a map. If you check the common scale for the maps in your area before buying a compass and can get them to match, this can make map work a bit easier. A common scale for USGS topographic maps is 1:24,000, but this isn’t always the case – so check. 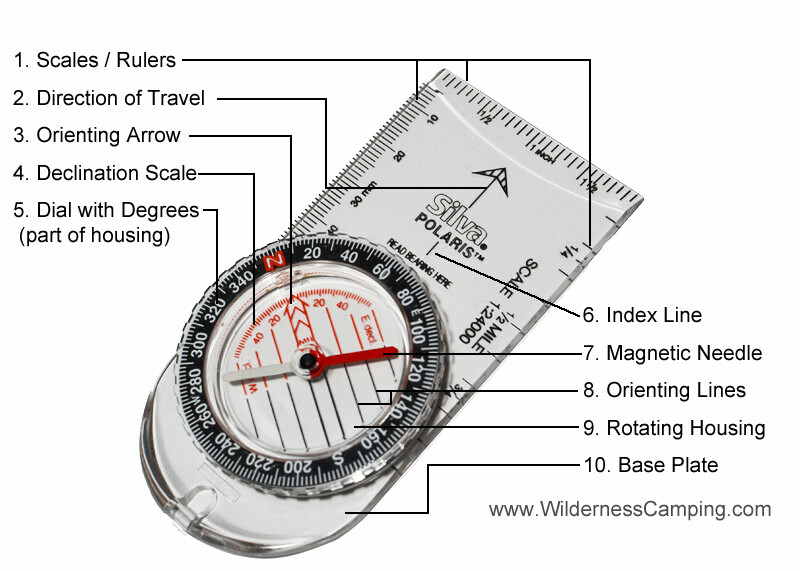 If your compass and map scales don’t match, most orienteering compasses have centimeter and inch scales. This is an arrow that is marked on the baseplate. It guides the direction of travel while following a bearing in the field. The orienting arrow is marked on the bottom of the housing and rotates with the housing. It allows the baseplate to be aligned relative to the magnetic needle. To take a basic field bearing, the housing is turned until the orienting arrow and the magnetic needle are aligned. These two elements are then kept in alignment while following the bearing. Declination is the difference, in angle of degree, between magnetic north and true north. The declination scale makes it easier to adjust for this difference. More advanced orienteering compasses often have an adjustable declination scale that can be set, usually by way of a tiny screw on the bottom of the compass. The dial is part of the housing and is marked in two degree increments. When the dial is rotated, the orienting arrow, declination scale and orienting lines also rotate as part of the housing. This is where a bearing is read. A bearing is an angle relative to true north (true bearing), or magnetic north (magnetic bearing). A magnetic strip of metal that is on a pivot in the center of the housing. The north end is usually painted red, while the other end is often white or black. These lines are marked on the bottom of the housing and rotate with it, the same as the orienting arrow. They are also often called meridian lines and north-south lines. When taking a bearing from a map, the orienting lines are aligned with the north-south map grid lines. A liquid filled capsule that contains the magnetic needle. Orienting lines are etched on the bottom of the housing, and the dial is fixed to the top of the housing. The liquid helps dampen the needle movement, making it easier to get a more accurate reading. The base plate is used to taking bearing on a map. The edge is placed between two points and the orienting lines and dial act as a protractor to give the bearing. The base plate is marked with scales, direction of travel arrow and index line.